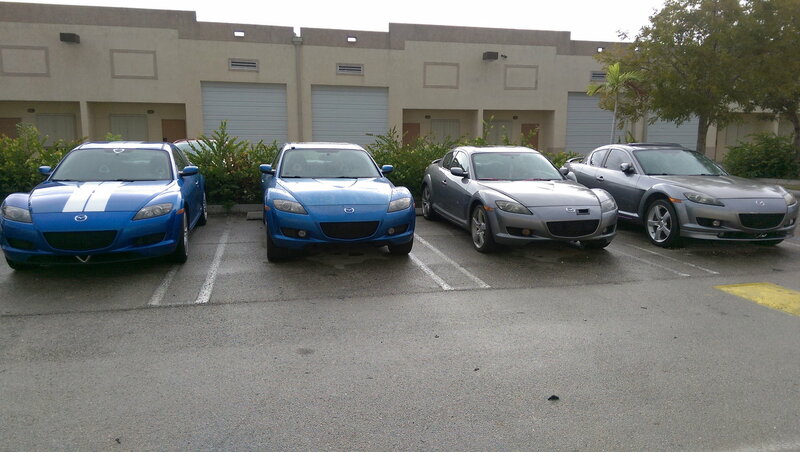 Carlos Lopez of CLR Motorsports in Miami is currently working on the ultimate rotary swap for RX-8's. Carlos is an extremely well known rotary mechanic with an incredible amount of experience building high powered rotaries for racing and street. The key to this swap is you will be able to run the OEM ECU to have all electronics work. The videos on YouTube are extremely detailed and informative. This (quite a few of his videos actually) is posted elsewhere on here already. These are fairly new, but it would not surprise me if someone linked to them already. These were just posted in the last month or so. The 7th video was posted just 2 weeks ago. Should have engine in car with proof of concept in the next couple or weeks. There are many ways to tackle the earlier 13B swap. Just depends on what you want and what you don't want. I'm an RX-7 guy. Don't claim knowledge on RX-8's though I think they're pretty awesome. I'm sure there is a number of ways to get the 13B motor in an RX-8. This seems like one unique way to keep the OEM ECU. Not sure there are others. I've gotten to know Carlos through the years and I know he is truly dedicated to the rotary engine and making it better. Just putting this out there as what seems like a pretty good option for people wanting their 8's with more long term and reliable power. Carlos is the man no doubt. With the cheap prices of used RX-8s only means there will be more swaps to come. Latest update. Motor nearly done about ready to go in car and test for proof of concept. Gotta love that EFR sweetness!!! Last edited by firecran; 10-03-2015 at 01:25 PM. Nice setup retaining stock functions. Only thing I'm not a fan of is the whole counter weight machining, I think it kinda makes it proprietary, the whole rotating balance needs to be matched and balanced, and you can only use counterweights machined by him after that. I saw a thread on 7club a while back where someone machined the inside of the front renesis cover to accept the REW counterweight on the block. Basically cutting off a section inside the Renesis front cover. Another thing I didn't see him mentioning is what oil pan he's gonna use? I don't believe renesis or Rew oil pan will fit with the hybrid cover/block setup. That OMP position sensor is super close to the turbo inlet tho I'm guessing they aren't gonna run a filter? Last edited by GK1707; 10-03-2015 at 02:15 PM. Depends what you want to modify. Many variations to complete this swap using different front covers and keep stock functions. REW oil pan fits fine... just one bolt hole does not line up and not used. Not a big deal...my oil pan doesn't leak without it. Why would you want to a air filter down there next to the engine/radiator sucking in hot air? A TID out to the front opening would be fine. Ah good to know REW oil pan fits, I honestly think machining the renesis front cover might be easier bc with his method you'll have to get the whole assembly balanced. More work I guess. And yeah I later realized they would prob have to run a intake from the turbo inlet out to the front. That manifold is short. It's a S4 TII manifold. I think he is just using it for mocking up turbo position but who knows. S4, S5 TIIs have a different flange style to the more common T4 footprint. If you watch the whole series of videos (very lengthy but thorough), the turbo to be used will be a hybrid TII housing with Holset internals. The aim being economy since both are cheap and easy to get, but will support around 380 hp....(don't quote me, it's on the video). Yes, machining needs to be done to fit the Holset internals , but any competent shop can do that, or there are turbo alternatives. Sure the rotating assembly will need to be balanced, but people will be able to pick the parts of the kit they want depending on their level of skill. I see now there are many ways to do the swap. However this one is going to retain the sock ECU and various functions that seem to be an issue with many swaps. Last edited by galognu; 10-03-2015 at 10:55 PM. Hey Galo I was planning on starting a build thread on these forums but it looks like you beat us to it. I'll just hijack your thread instead. To address everybody's questions about the counter-weight, yes it is a proprietary set up. After all CLR is in business to make money and probably will patent it as well so that other companies don't reverse engineer our product and under-sell us. We will have a basic kit available soon with all the necessary brackets and machined parts for the do it yourself crowd who have 13B motors and their own turbos etc. at a reasonable price. We will also have drop in kits with all the machining done to the internals like you see in the videos for those who have an RX8 they want to upgrade. We are building turn key cars (both 1st and 2nd gen RX8's) with all the upgrades done including the fuel pumps and lines, exhaust, suspension etc. to make the car handle like a dream. Not only will we have kits for the 1st gen RX8s but also the 2nd gens as well. From what I have investigated to far, the transmissions on the 2nd gens are much stronger. The fuel system is also better. The 2nd gen's ECU is going to be an issue however as we will need to tap into the wiring harness instead of just plugging in the adaptronic to the stock ECU like we are doing on the 1st gens. Anybody serious enough to build a purpose "built" engine is going to want to at least balance it. (they also should consider scalloping the rotors, lighten the rotors, clearance the rotors, use 3 mm apex seals, port the engine and do the cooling mods to the housings as well). Mazda has one counter-weight for all REW engines. One part # fits all. All we have to do for those running the bone stock REW build (not cosmo motor like in the link above posted by GK1707) is machine the counter-weight we are using to match the stock REW rotor weight. Our design doesn't require you to blow a hole in the front cover that needs to be welded up just to accept the REW counter-weight. Of course your going to have to be conservative with the boost with a stock REW set up so as not to implode the REW rotors because they cannot withstand the kind of boost we plan on running with the project car we are building. Our goal is to make the swap as trouble free as possible so that it is a reliable hi-boost drop in plug and play deal. We don't have to put the turbo on top of the engine by the radiator where heat build up becomes a big issue because we are not using the stock RX8 mounts like Chris is doing in his build thread on the RX7 forum. (Thanks for the link by the way its the first time I've seen it and I'm sure it will be well worth the read through.) From my first glance at it, he is running into many interference points we don't have like the alternator. I do like the mods he did to the stock OEM hood for ventilation. I had a carbon fiber Seibon vented hood (see pic) that I sold with one of the stock RX8's we rebuilt that cost $1200, but it really wasn't that much lighter and I prefer the clean stock hood's look anyway. Also on our you tube channel. I was just setting up the stage for you. Since there is only links to the video you can always start a new thread with even a more grandiose title as I'm sure once you have a product it will be a game changer in regards to RX-8 rotary swaps. Can't wait for it!! I actually like your title - swap to end all swaps. It truly is the holy grail of RX8 swaps if we succeed as we hope to do here shortly. Good to see some feedback from you guys on here. It is a very nice setup and it seems problem free. Thanks for addressing the benefit of the counterweight machining vs the front cover machining. Mainly what I was skeptical about. Looking forward to seeing this kit thru and finished. I also look forward to your tests and results. As one who has personally seen just about every rotary engine mod and advancement for street and track, over the past 43 years (and spent the bucks on my share of them) ,this looks like a quality build and solution. Cheers ! Pretty interested to see pricing on the various options. This price goal is very reasonable when you consider that just the turbo set up for the renesis engine is being sold online for around $6800. The computer is $1500, a stock renesis motor nowadays will set you back over $4000 etc. A fully built FD motor will set you back around $10000. We are building turn key cars with all the fuel mods, exhaust, mods, suspension mods and the FD built motors for less than what the RX-8 originally sold for new which was around $30,000. Considering what you are getting - a car with a brand new motor with well over twice the horsepower that has all the stock functions and is reliable and can handle whatever you throw at it, they will be a bargain. 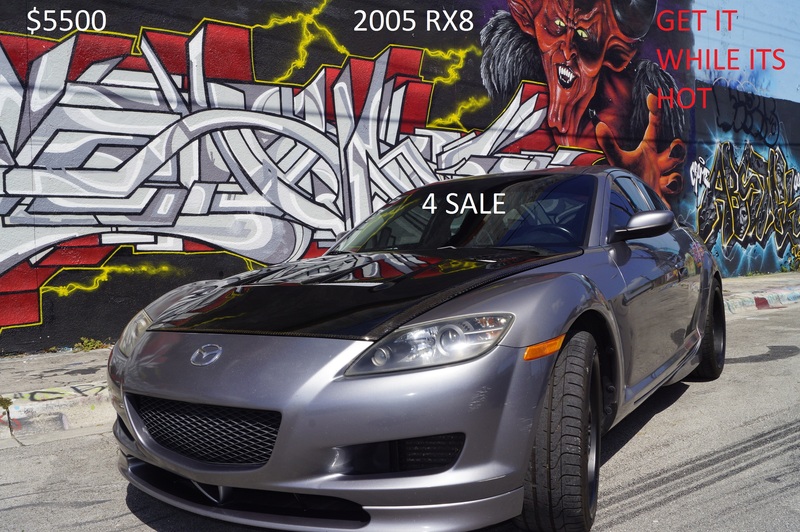 We are also planning on building 2nd Gen RX-8's with the set up as well but of course they will probably run over $30,000 based on what the stock 2009 and up are selling for. If you want to do it yourself and save money, if you have the skills and tools you could probably build the hybrid motor for less than what it would cost to just replace the renesis with a factory remanufactured motor. We will supply all the custom built brackets and front cover mods and counter-weight in a bare bones kit for the DIY crowd. I will update once we get to work installing the motor in the car. Carlos has race motor commitments he is currently working on so we are hoping to have this done by the first couple weeks of the new year - or maybe sooner. I am prepping 4 cars to accept the motor and will be updating the website shortly putting them for sale as is with the fuel system upgrades, LS2 coils, exhaust mods, suspension mods, etc for those who want to get started right away and be ready to rock and roll when we go into production. We will be keeping one for a demo car so you can come and take a test drive and be blown away. Homestead speedway is right down the street from us, so we will be taking the car to track days there for test drives. Should be a blast! once we drop the motor in the car and fire her up. We have just linked up a storefront to the website where we will start listing RX8 performance parts for sale. If you are hoping to join the retro rotary revolution you will need to upgrade the ignition and fuel systems of the RX8 to handle the increased power. A high speed starter will also be a nice addition. We are going to be listing a custom exhaust system as well that will maximize the power output with and without catalyst for those in emission restricted areas. All the necessary peripherals you will need to do it yourself, like the adaptronic computer will be available on the website as well. We can do the tuning for you on the dyno so the swap will be truly plug and play. Carlos just got back from Guyana where the Turbo RX7 he worked on and tuned set the 2nd best lap time up against 700HP AWD EVO's. He built a custom Exhaust Manifold that enabled the largest EFR Turbo they were running on the car to reach full boost at 3200 RPM.